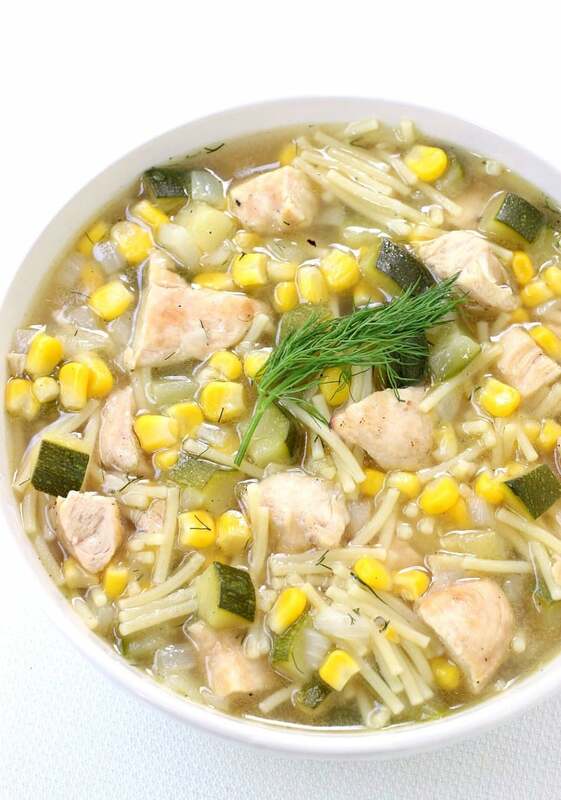 Summer Grilled Chicken Soup is the perfect comfort food dinner for dinner, even on warm summer nights! We love having soup for dinner all year round. Which is kind of funny since a few years back I wouldn’t even think about having soup for dinner. I don’t know why, maybe I had a bad experience with soup at one point but it never really was the type of meal I wanted to have. And now I can’t wait to have it. 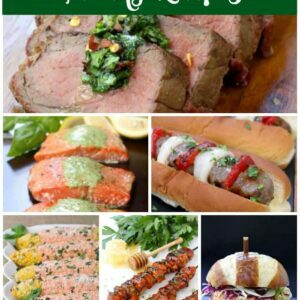 In the winter, definitely, it’s one of our go to meals. Anytime we have chicken or turkey or ham the night before, we’re having soup the next day. Like I said before in our turkey soup recipe post, I’m standing there with an empty soup pot after Thanksgiving at my parent’s house waiting for them to give me their turkey bones. It might sound strange to you unless you’ve actually made homemade turkey soup, but I’ll tell you, it’s so good and it feeds us for days. And any meal that we can make that last two or three days around our house is a keeper since I’m pretty sure our boys are going to eat us out of this house pretty soon now. when you don’t have a big chicken carcass laying around. If you have leftover grilled chicken, perfect – dice it up and throw it in here. 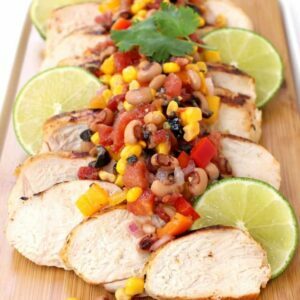 You can use a rotisserie chicken or any leftover chicken you have but the grilled chicken definitely gives this soup a summer flavor that we really liked. For our summer vegetables we used fresh corn and zucchini but here too, you can swap out whatever veggies you like or have on hand, or maybe just grabbed from your garden. And the noodles? Well, Christie tells me all the time that I like my soup more like a “stew” since I’d rather have a huge bowl of noodles with just a little broth. She’s sort of opposite, and the boys are somewhere in between. 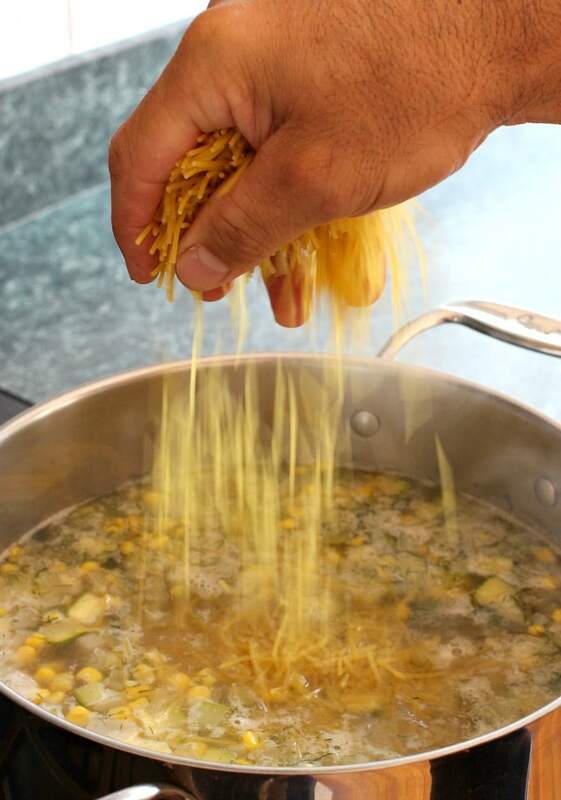 So if you like a lot of noodles, use the 2 cups of spaghetti in this recipe. If you like more broth to your soup cut it down to 1 1/2 or even one. But let me tell you, when you’re done making this soup, it will seem like you made it from scratch, right from those chicken bones, when it really only took you about a half an hour. 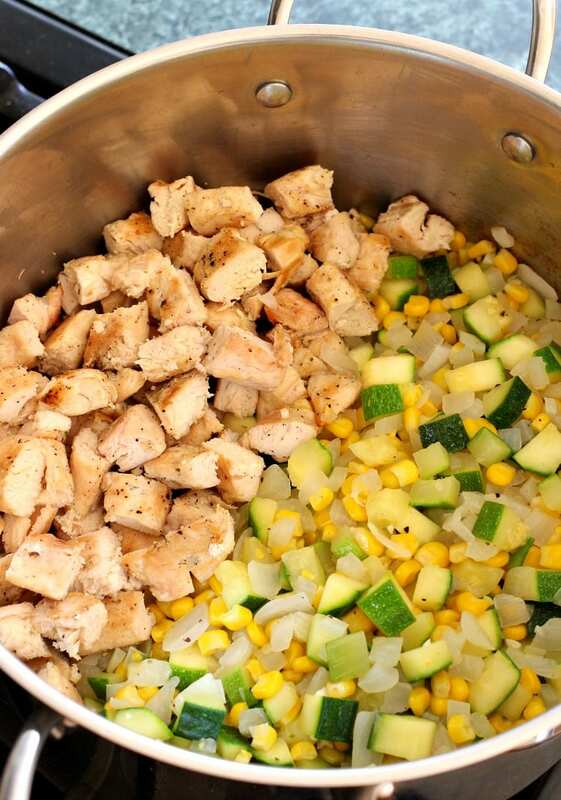 Start by cooking up onions, the fresh corn and zucchini. 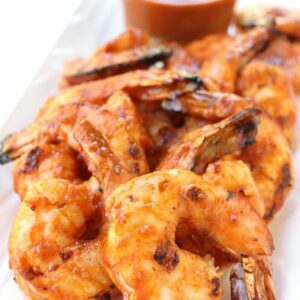 A few seasonings and then you can let that cook down for 15 minutes. Then the chopped grilled chicken goes in, covered by chicken broth and that’s sort of it. Let it simmer for 15 to 20 minutes and then add in the noodles and let them cook. All that’s left to do is let the pasta cook, add in fresh dill and eat. 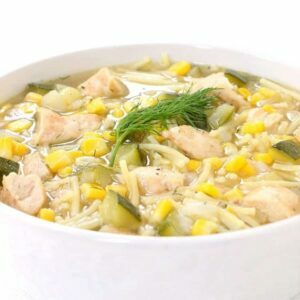 I think this Summer Grilled Chicken Soup might become one of your favorite summer time soups too! 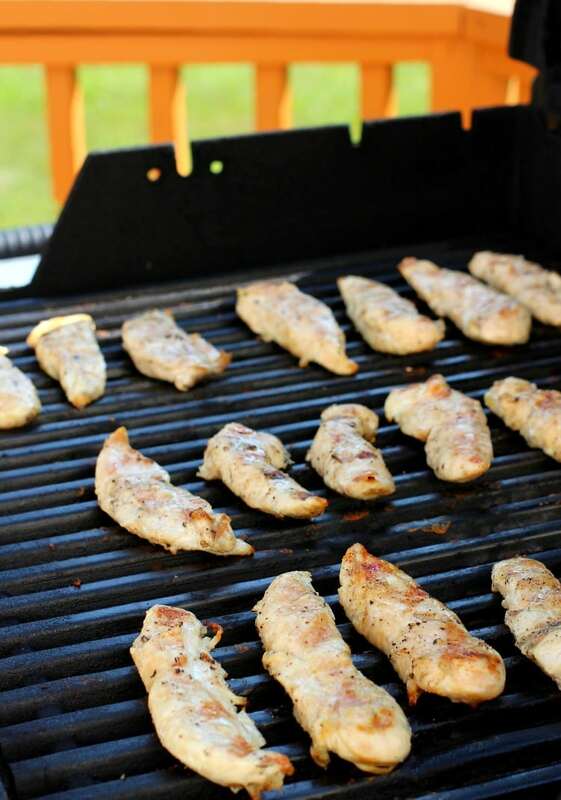 Season the chicken tenders with the salt, pepper and olive oil on both sides then grill for 2-3 minuets on each side until cooked through. Remove to a cutting board and cut into bite sized pieces. In a large soup pot, add the olive oil and the onion and cook, while stirring for 5 minutes. Add in the zucchini, corn, salt and pepper and stir. Cook for another five minutes then add in the diced chicken and chicken broth. Bring to a boil, then turn the heat down to a simmer for 15-20 minutes. Add the pasta to the soup, stir and cover and cook for 10 minuets. Stir in the fresh dill and serve. Sarah, thanks for letting me know! I’m glad you enjoyed it! This soup is amazing, entire family loves it. The dill really adds that extra flavor. I make this soup every couple of months.Thanks for this recipe. I love hearing that – it’s one of our favorites too. Thanks for letting me know! 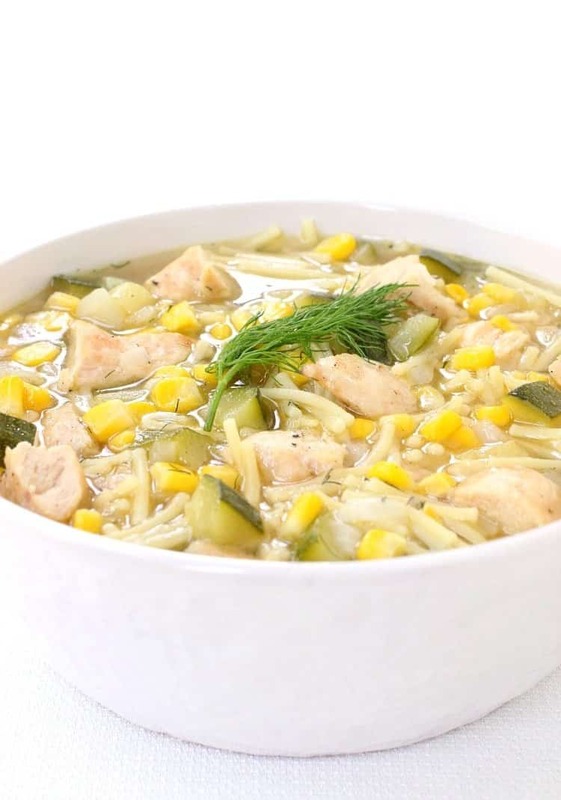 Great soup with fresh summer flavors… I made it from scratch with a whole chicken and ears of bi-color corn, but could’ve thrown it together with rotisserie chicken and frozen corn, or even leftovers. I’ll definitely try it again and might experiment with a few variations. Thanks! We do that ALL the time! Cutting down trips to the grocery store is key for us!